In 1840, Queen Victoria of the United Kingdom wore a white wedding gown in her marriage to Prince Albert of Saxe, Coburg and Gotha. The plain satin gown was made from fabric woven in Spitafields near London and trimmed with a deep flounce and handmade lace from Devon. William Dyce, head of the then Government School of Design (later the Royal College of Art) designed and mounted the lace on the white satin dress made by Mary Bettans. The tradition of the white wedding gown is attributed Queen Victoria. More recently, Kate Middleton wed Prince William of the United Kingdom, and her memorable gown has been complimented and copied many times. Sarah Burton for Alexander McQueen designed this beautiful dress in ivory satin gazar, organza and silk tulle. English and French Chantilly Lace applique and hand-embroidered flowers embellished the gown. In a tribute to the United Kingdom, the gown featured the country’s floral emblems: the rose, thistle, daffodil and shamrock. 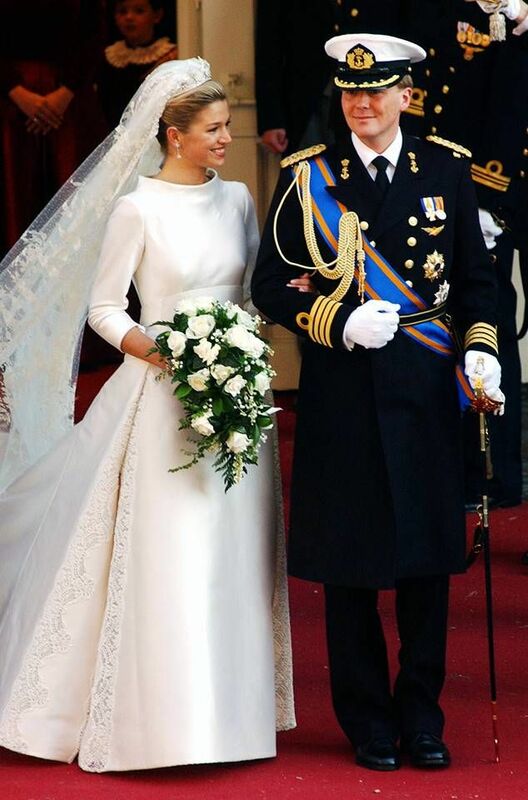 The finishing touches were an ivory tulle veil and the Cartier halo tiara on loan to the bride by Queen Elizabeth II. Martha Louise of Norway wore a very romantic gown inspired by the lily flower and gothic arches of Nidaros Cathedral where she and Ari were wed. The couple’s initials, A and M, were woven into the design of the dress. Wenche Lyche fashioned the gown of off-white duchesse with a Swarovski crystal-embellished coat and a brooch of cultured pearls, diamonds and gold. She wore a silk chiffon veil with her great-grandmother Queen Maud’s pearl and diamond tiara. Their nuptials were in 2002. 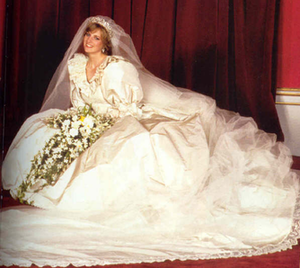 In July of 1981, Lady Diana Spencer wed Charles, Prince of Wales. The dress set wedding fashion trends after the wedding. This Victorian-inspired gown, designed by Elizabeth and David Emanuel, epitomised the decade’s love of extravagance with its big shoulders and enormous train (that barely fit into the glass coach in which she was to arrive). The woven silk taffeta was hand embroidered, its bodice filled with lace, and decorated with sequins and 10,000 pearls. The lace was antique handmade Carrickmacross lace that had belonged to Queen Mary. On April 18, 1956, the beautiful actress Grace Kelly married Prince Ranier III of Monaco. Her tulle gown was the work of MGM Studios designer Helen Rose. 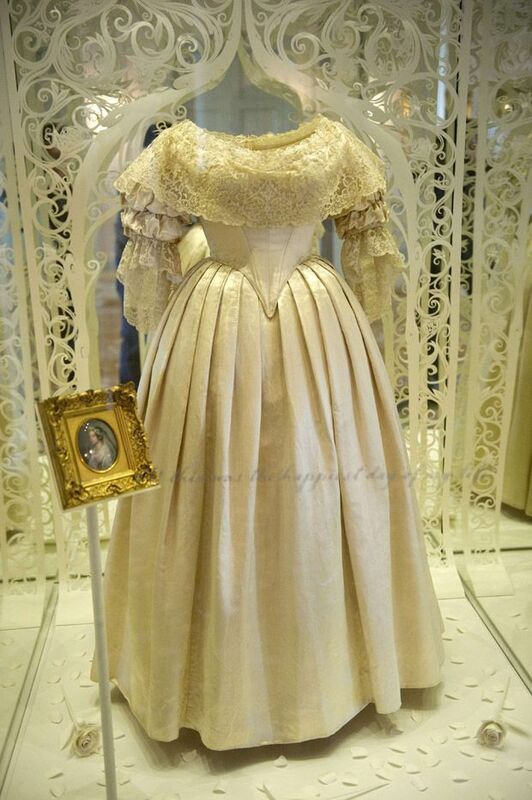 Ms. Rose also fashioned the pale pink dress worn for the civil ceremony. The religious service was the second of two ceremonies. Princess Grace’s gown is one of the most elegant and best-remembered gowns of all time. Rose point lace adorned the bodice, veil, train insert and prayer book the bride carried down the aisle. Valenciennes lace was used for the skirt support and ruffled petticoat, and taffeta for the skirt. In a quite unique design, the bodice was attached to an underbodice, a ruffled skirt support (forming the unique bell shape of the skirt) and a slip. Then came the skirt, which itself included three attached petticoats underneath the faille exterior: one for foundation, one ruffled for volume, and the top petticoat for smoothing. A separate pleated taffeta cummerbund joined the top and skirt. Lastly, a lace train insert was added in to the back. Princess Elizabeth’s (Elizabeth II of the United Kingdom) wedding to Philip Mountbatten took place at Westminster Abbey on November 20, 1947. Norman Hartnell, Court Designer, designed her gown of soft white satin with a high neckline, tailored bodice, and short train. Crystals and 10,000 seed pearls, imported from the US, adorned one of the most unforgettable wedding dresses of all time. The train, symbolic of rebirth and growth after the war, was claimed to have been inspired by Botticelli’s 1482 painting of Primavera, especially the elaborate embroidery treatments of scattered flowers on the opulent satin dress and the tulle veil. The 40s were austere times. Following the war, Princess Elizabeth had to use clothing ration coupons to buy her dress. The wedding dress worn by Meghan Markle at her wedding to Prince Harry on 19 May 2018 was designed by the British fashion designer Clare Waight Keller, artistic director of the fashion house Givenchy. The material was silk. I could go on and on. The above examples are only a few of the graceful, gorgeous, and iconic gowns of the Royalty. This entry was posted in Uncategorized and tagged Grace kelly, megan markle, princess diana, queen elizabeth, queen victoria, Royal Wedding gowns, royalty. Bookmark the permalink. Such an interesting post, Linda. The gowns are gorgeous, and the history is very informative. Thanks for the research! I am Cinderella at heart. Wasn’t Elizabeth pretty?